Einstein: "Condemnation without investigation is the height of ignorance"
Discussion in 'Quotes Debunked' started by Ray Von Geezer, Nov 23, 2015. I've seen this quote variously around the Interwebs, and more recently in a member's signature here, and wondered where it actually came from. It really doesn't sound like the kind of thing a scientist would say, at least not in the context it's commonly finding itself used nowadays. Initial investigation (Googl'ing) soon showed that there's no evidence of Einstein (amongst several others) having said it. Looking a little further I found the source is much, much older, and it's had a pretty fascinating journey; from the original author, an 18th century clergyman, to its contemporary (mis)quoting - visiting with homeopathy, Alcoholics Anonymous, Freemasonry and the Jehovah's Witnesses along the way. In this context, the author was trying to challenge “the mental attitudes of many alcoholics when the subject of religion, as a cure, is first brought to their attention.”  In later editions of Alcoholics Anonymous (1955, 1976, 2002), this author’s chapter was replaced, but the Spencer quotation is preserved in an appendix to encourage people to keep an open mind about the religious or spiritual remedy that Alcoholics Anonymous prescribes for its members. Since 1939, over twenty million copies of Alcoholics Anonymous have been printed, and with each copy, another copy of this quotation attributed to Herbert Spencer. The quotation has since been used by a variety of authors. A variation has even appeared in one dictionary of quotations. On the Internet, new variations multiply and mutate. By now, the quotation is famous, and has made the nearly forgotten Herbert Spencer famous in the 21st century for saying it. But Herbert Spencer never wrote or said anything resembling this quotation. It is derived from a Christian apologetic work by the 18th century British theologian William Paley. The variations of wording that have come down through the past two centuries only bear a skeletal resemblance to Paley’s original meaning and form. The Internet has been an essential tool in researching this quotation’s origins and history. It has also contributed to the spreading of the quotation and to new generations of mutations and attributions. The contexts in which we find the quotation continue to fit into the category of alternative knowledge: ghosts, Big Foots, astrology, Atlantis, British-Isralism, pyramids, Twelve-Step spirituality, homeopathy, chiropractic, faith healing, etc. But it has also extended into sales pitches, essays on a variety of topics, and various arguments on online discussion boards. There are also a growing number of databases of quotations available as online reference works which attribute this quotation to Herbert Spencer. A Google search on the Boolean phrase (“contempt prior to investigation” +Spencer) gets over 4,200 hits. The phrase (“contempt prior to examination” +Paley) gets 7 hits. There is no way of knowing for sure when the quotation first appeared on the Internet. It was probably first transmitted via email in the early 1970s or in the late 1970s on a usenet newsgroup or a listserv, some of the first discussion groups on networked computers. The first web pages as we know them didn’t appear until the early 1990s, and this is surely when the quotation began to replicate and mutate beyond control. Google keeps a searchable usenet archive. The earliest use of the phrase “contempt prior to investigation” in a usenet discussion is from 1986 on the newsgroup net.sci. The following examples are a partial survey of some of the variations that have spawned on the Internet. Because these are easily found using Google or another search engine, I am not including source citations. The variety of variations is sure to continue growing. “Condemnation without investigation is the height of ignorance,” is an abbreviated form that has been variously attributed to Albert Einstein, Ernest Hemmingway, Thomas Edison, and Ralph Waldo Emerson. neat. 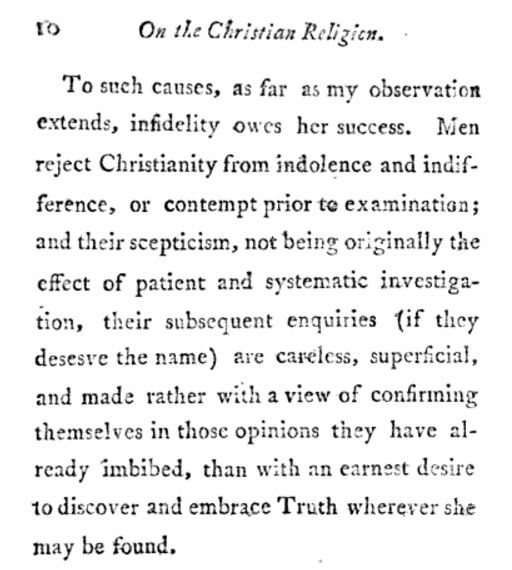 The book "Paley's Evidences of Christianity" 1839?1854 . not sure i would agree it is only a skeletal resemblance, sounds pretty much the same to me except for maybe "height of". edit add: well wait, i have to read the dang thign to see if that is from Paley himself as it seems our "editor" Charles Murray Narnes, added notes from himself and others. either way its in this book before Einstein was born. my bad, above is an older version. 1802, by a "W. Cunighame"
i love this thread topic @Ray Von Geezer . Not only is the original context of this "quote" completely different then what i assumed it was about based on the "einstein" tag. But its a great example of something i often ponder. Does a "quote" belong to the person who said it exactly (or very close to exactly), or does a quote belong to the person who came up with the original idea behind the quote. It's interesting to see how it's been taken from its original meaning and evolved in over two centuries, particularly how it seems to have regularly been appropriated to justify belief in "woo". I think for me some quotes are so good they can stand up on their own, so it barely matters who really said it. Like the old "The definition of insanity....", another "Einstein" truism... (or not...). This one though.... I can see how it makes sense in the original context, but "If you don't take any old tosh that I care to throw at you seriously, then you're a fool. Einstein sez." is pretty ridiculous, even if he had said the original quote. I guess it's a fictional response to something like Brian Cox saying "The problem with today’s world is that everyone believes they have the right to express their opinion AND have others listen to it....."
oh yea, i didnt mean einstein of course in regards to attribution of that quote. i meant more do we attribute it to Paley or maybe "Narnes" whose paraphrase is alot closer. Attributing it to einstein at all, without a reference that he ever actually said it anywhere, is dirty pool because people think Einstein was super smart so must be right. from above pdf.. more 'smart' people who supposedly said it. Googlable for verification says the PDF author.